This post needs little introduction as most in the running community are aware that Scott Jurek, who is known as one of the greatest ultrarunners of all time, is currently attempting his most ambitious adventure yet – he is aiming for the FKT (fastest known time) on the Appalachian trail. He is running the 2,160 mile trail from Georgia to Maine. As of this post he is in New Hampshire and closing in on the record. 1) As I mentioned above Marshall’s remarks reflect his opinion and he is entitled to that. However in his responses to some of the comments made he is citing his opinion as fact rather than evidence-based findings. I feel that in order to have a meaningful discussion about the topic you should do some research first. 3) Marshall mentions that during his Run Across America he lost only four pounds. That is great for him! He is judging Scott’s health based on a picture. While I do not intend to do the same, I did search for multiple pictures of Marshall and it is my opinion that he has a different body type than Scott. Comparing how Scott’s body handles a multi-day event to how his own body fared would be like comparing myself to Shalane Flanagan. 3) Marshall ran across the US on roads. This is an amazing accomplishment and I applaud him. I am not in any way downplaying his athleticism. However Scott is running the Appalachian Trail which arguably produces a different amount of wear on the body. So again this is like comparing apples to oranges. I don’t think I need to explain this any further. 4) I find it disappointing that Marshall felt the need to make this comment during Scott’s run. Scott is not only tackling a major goal and dream of his but he is also crushing it! He’s a fellow athlete – why not show support and keep your negative comments to yourself? To me being a professional athlete isn’t only about your accomplishments, but how you conduct yourself – how you treat your fellow athletes and fans. I feel like these comments are in bad taste. 5) I find it odd that the focus is on his vegan diet and not a question of “is he eating enough?” Newsflash: you can get enough calories/fat/protein on a vegan diet! Are we seriously still having this discussion? That argument has been squashed long ago. Why are we fixating on it? 6) Finally, what I will never, ever understand is why anyone feels the need to bash the vegan lifestyle. We are not hurting anyone with our choices. Our actions come from compassion – compassion to animals that we view as fellow beings who deserve our respect, and compassion for our environment that we wish to protect. And with that I wish Scott continued success on his journey. I think everyone can agree that it is awesome to witness what he is accomplishing – vegan or not. I also look forward to watching Team USA at the Women’s World Cup Final tonight as I support all fellow athletes who exemplify passion for their sport, determination, and talent. This entry was posted in vegan nutrition and tagged #AT, #FKT, Appalachian Trail, Marshall Ulrich, Scott Jurek, vegan, vegan runner by lljkline. Bookmark the permalink. Marshall clearly feels threatened, otherwise there wouldn’t be a need to post such a disappointing article during Scott’s AT crossing. And as you rightly pointed out, he basically has no clue about (vegan) nutrition, which is quite a surprise for a professional athlete. I like your comment that vegans are just going about their days, doing their stuff, often quietly and without glory and are having great success in the process. I used to get into a lot of arguments and discussions about my vegan diet and trying to defend my choices. These days (7.5 years into my vegan journey), I just let people talk until they’ve exhausted all their silly excuses and jokes and suggest that if they really want to challenge my diet, they should line up against me at the start line of the next run, ocean swim or triathlon and we’ll see what happens. Thanks for standing up for not only Scott’s and every other vegan’s choices, but also the animals and the planet! thank you for this. I was frustrated by this post as well. I am still unsure why people think someone’s vegan diet is subject for debate. And like you said it could be brought up if he is getting enough calories. I am so sick of the small minded thinking. I actually lost a tremendous amount of respect for him. It’s funny when I was 50-70lbs over weight no one was concerned about my diet. Now that I run marathons and soon ultras and my BMI is 22.5 people wonder if I get enough protein. Mind you I routinely eat 4000-5000kcal per day. Awesome achievement Brian – congrats!! All I can say is -THIS. Your words stand alone. I agree. I can’t believe we are still having this “you can’t get fats and proteins from plants” discussion. I am not a vegan or a vegetarian, and even I know that is completely false. The bottom line is, every single person has a unique hormonal and chemical make up. Just because he may have tried a version of “vegetarian” at some point and it didn’t work doesn’t mean it won’t work for any athlete ever, anywhere. I cannot stand when people carry that point of view. “It works for me, therefore it works for everyone! !” or alternatively “It didn’t work for me at all, therefore it won’t work for you, either.” Why is it so hard for people to wrap it around their brains that everyone’s body needs different things to be at an optimal level? 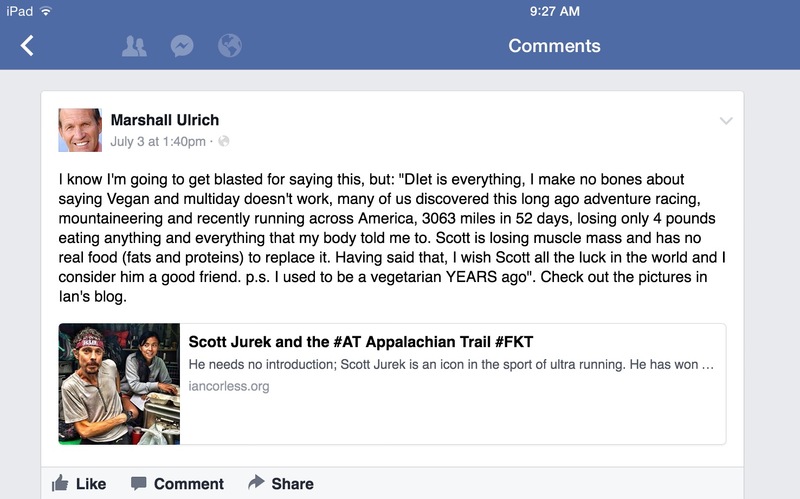 He can’t tell from the massive achievement list that Scott Jurek has that his body does quite well on plant food? It’s not like he’s new to being plant-based, it’s only been 16 years (and the entirety of the most successful part of his career). Yes thank you! I’ve always taken the “it works for me” stance. I’m not going to put a fellow athlete down because they do not follow my diet. Results speak for themselves! I appreciate your comments. I have the feeling Scott’s results speak for themselves. I’ve been vegetarian from time to time, but had frankly never taken veganism seriously until I become aware of Scott Jurek. He’s an incredible emissary for not just running and ultrasports but the vegan lifestyle/diet in general, and his book Eat and Run has some incredible recipes that even the less familiar can pull off with aplomb. Scott hardly needs any defense and I’m surprised and confused to see such vitriol directed his way. Different diets work for different people, and no matter the diet there are plenty of people who do it “wrong” for their own body as they learn the ins and outs of dietary sensitivities and the balance of workouts and recovery. It’s a shame to see this kind of critique (which is hardly an objective critique at all) loaded into the conversation, but I suppose it’s human nature and has a certain inevitability to it. Thanks for your own thoughts on the situation – I came to this article via Christopher McDougall. I am behind Scott 100%! As a fellow runner who does not consume meat of any kind, I have never felt better! It is sad that this was put on Face Book as Scott was in the midst of his challenge.Scott has nothing to prove in regards to his vegan diet and physical capabilities, he is an incredible athlete! It was sad but not surprisingly there has been resounding support for Scott which is great! The most important thing is how Scott Jurek feels. If he genuinely feels strong and healthy, he should just keep doing what he’s doing. However, looking at some of his pictures does make me think he’s losing too much weight; I would add lots of fresh coconut (including coconut water) to his diet. Moreover, if he is a vegan for ethical and compassionate reasons, I would add plenty of yogurt from an organic farm where cows are sheltered when they stop producing milk. There are a few such farms across the US, mainly Hare Krishna farms like New Talavan in Mississippi, where cows live to be 20-25 years old. I’m sure once he finishes he will add back whatever weight he lost. You are right – if he feels strong and healthy no one knows better than him what he should be doing. Milk is produced by inseminating cows for them to start producing and then once the veal is born, kill the veal for meat or let her grow to be another milk producing animal. So happy sheltered cows doesn’t mean that everything’s clean. Nonsense. Every single newborn calf at New Talavan is sheltered. They have almost 90 animals and have been doing this for over 40 years. Never have they killed a cow, bull, or calf. Furthermore, cows get pregnant the natural way. They have several pens (across 1,200 acres of land) where they place (and rotate) cows and bulls according to their needs. I know because I used to live there. #1) Is this a bad thing that he is losing some weight? This is a racing strategy…why not run lean and light during a multi-day race? That seems like smart racing to me! #2) Is Scott getting enough calories every day? This has nothing to do with being vegan. He could drink some coconut oil or eat a bunch of nuts to get more calories. He knows enough about nutrition that most likely he is just doing what he needs to do to survive and finish. The story of Scott’s FKT attempt is one of courage, focus and perseverance. Diet is a sideshow (or at least it was until Marshal made it an issue!). I don’t think diet is a side show. As Scott wrote in his book, Eat and Run. This guy spent years of studing plant based diet (which is slightly different from vegan) and to prove it works, he’s doing some amazing things. After that, who will be able to say bad things against plant-based diet? Not getting enough protein? What the heck is that argument. Personnaly, I’m glad that such an article came up. It enlight the fact that this mentality is wrong. Go Scott Go! I’m an age group triathlete who hiked the AT years ago when I was in my early 20’s. Scott’s run is an unfathomable feat. I can’t imagine anyone having anything but admiration for it. It’s so impressive to see the outer limits of human ability. That being said, it’s also hard to comprehend trash talking Scott’s diet. That’s just weird. Thanks for writing this. It’s refreshing to see Scott being stood up for. Endurance athletes rock & this AT adventure is awesome! End of story. I transitioned to a plant-based diet (I shoot for 90% vegan) as an avid gym goer and ultra-marathoner runner this past October (I’m a certified fitness instructor and yoga teacher too for what that’s worth in this forum). I found that it reminded me of childhood since I always loved the veggies and fruits so much more than any meats when I was little. I also found recovery time from the exact same regimen of workouts and miles was WAYYY faster with a plant-based focus. The way I was taught in my natural fitness training by a well-respected guru of fitness, the dairy really prevents you from absorbing other nutrients beyond the milk within it. I haven’t cross-checked this but that may explain why, although it has some nutrition, milk-based products can really hamper in other ways. It’s also really strange that we have to defend veganism but it’s totally normal for a human mammal to drink another mammal’s mammary milk! haha Can you imagine a cat hoarding massive amounts of milk from a bunch of raccoons? It just doesn’t make sense but we have a mega-industry for it. Another funny thing: in any other sport, would you question or belittle the one who has been a champion time-and-time again? He has always beat everyone and done it back-to-back-to-back in many occasions (albeit this is a different era of his career no doubt). Great article, so surprised that anyone who you would think should know better would make a showpiece of their utter ignorance. Scott is continuing to do things beyond the limits of what most could dream of and has done so on a plant based diet. Kind of a bit late to make an argument when the person you are giving your opinion is continuing to spectacularly prove you wrong! Vegan runner in the UK. Go Scott! I’m not vegan, I weight my diet in favour of fruit and veg but usually eat meat on a daily bases. However I fully support your argument and think there’s a bit of “why isn’t everyone looking at me” going on here. Marshall seems to have a massive chip on his shoulder… That’s a sweet potato chip, deep fried in whale blubber by the way. This is really surprising from Ulrich. He not one to stir much controversy. Maybe he really feels Scott is doing some kind of damage to himself. On the other hand Scott has been vegan for years, and attributes his success to his diet. The whole argument is really strange. Jurek’s FKT is insane, andIi am happy to see him crushing it. I think no comments are necessary. You said it all with truth and it needs no elaboration. Love this post! Poor taste on Marshall’s part indeed. He can eat his words now that Scott has done it!